14. St. Joseph’s Catholic Church was originally built in 1819 by Fr. Matthew Malone and consecrated by James Doyle, then Bishop-Elect of the diocese of Kildare and Leighlin. 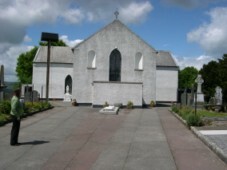 It was built on the site of a mud-walled chapel. 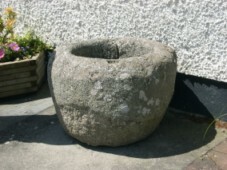 The three stone fonts in the porch came from this chapel while an old font from Linkardstown Church can be seen at the front of the church. The interior contains the striking stained glass window to the memory of Captain Myles Keogh who was born in Leighlinbridge in 1840 and was killed at the battle of the Little Big Horn in 1876. 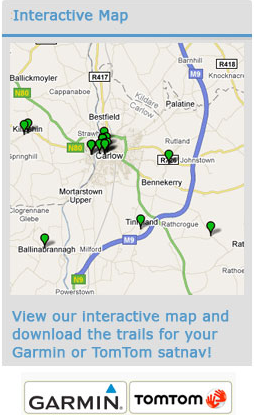 Keogh was born in Orchard House, Leighlinbridge in 1840 and was educated locally. At the age of 18 he may have been fighting with the French Foreign legion in Africa but at 20 he volunteered to fight with the papal forces in Italy and became a member of the Vatican guard. From there he went to America in the 1860s to fight with the Union side in the Civil War. He had achieved the rank of Company Captain when he fell with General Custer in the famous battle of the Little Big Horn. The Sioux Chief, Red Horse apparently remarked that Keogh was the bravest man they ever fought. 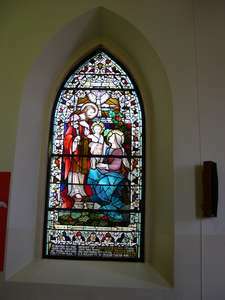 Opposite the Keogh window, another stained glass window depicts the baptism of Christ. This window, which dates to 1936, was designed by A.E. Child, a prominent stained glass artist attached to the group An Túr Gloine (The Tower of Glass). Open: Daily, 9.30 a.m. – 5 p.m.